﻿ At 4,300+ feet above sea-level (about 3 times as tall as the Empire State Building in NY, but half as high as the Western Ghats in India) Mt. 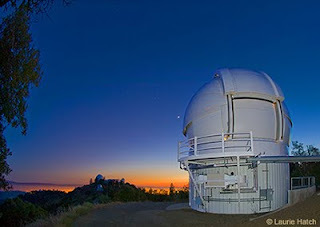 Hamilton is the tallest peak among the hills that surround Silicon Valley and is home to the Lick Mill Observatory (a mountain-top observatory that provides state-of-the-art research facilities and includes a very powerful telescope). One has to get on to CA-130 from Alum Rock to get to Mt. Hamilton. The 30+ miles from my house takes a little about an hour (took even more for me since I was enamored by the view and often stopped to take pictures) and is filled with breathtaking views of the city and countryside. The road itself is a narrow two-lane road (one lane in each direction) and in many places (like the picture above) treacherously borders some precipices that made even me sit on the edge of my seat at times. If you look closely at the picture above, you will see a house in the distance. The picture below is a close-up of that house. Since I had left late, the light started fading even before I had begun the ascent to Mt. Hamilton. But that diminished neither the beauty of the drive nor my enthusiasm - though there was a tinge of regret that I hadn't left an hour earlier. But I now have an excuse to drive up there again. Finally, 3 miles before the observatory - and perhaps just under 4,300 feet above sea-level - the fog got pretty thick and visibility reduced. With an energetic toddler in the back-seat - whose patience had surprisingly and mercifully held up till then (and thankfully, stayed put till I got back home! Thank God!) - there was no way I driving any further. At this point, I turned back. The picture below that completely blanks out the view of the countryside far below should give you an idea of how thick the fog was. A few 100 feet below, the air was still clear and I got an excellent view of a rather pretty sunset. And lo & behold! Civilization at last! Until next time. Which I hope will be soon.